The acquisition of a vessel is a major decision for a shipping company or a shipowner. The existence of an active second hand market for all types of vessels provides an easy and quick entrance for investors in the shipping sector. However, to co-existence of a newbuilding market makes them face the dilemma of investing in a new or a second hand one. 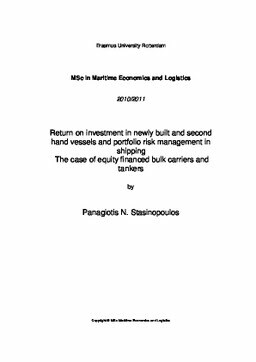 This paper examines the returns on investment in newly built and second hand bulk carriers and tankers for different operating strategies within specified investment horizons for the period of time between January 2002 and May 2011. Having modeled the returns, we end up in specific risk-return characteristics for each vessel per type, size and age and for each operating strategy. Furthermore, by estimating and reporting Sharpe ratios and utility values for investors with different risk preferences we provide a basis for comparison among them. The generated results suggest that newly built vessels have better reward to volatility and yield the maximum utility values for investors with only few exceptions. The Markowitz‟s portfolio theory is also applied to define the efficient shipping portfolios for successively increasing investment horizons in which more operating strategies can be included. Finally, the theory of portfolio leverage and the Capital Asset Pricing Model are applied to define the market portfolios, distinguish between the systematic and unsystematic risk of the vessels and measure their risk premiums.